The magic of Kashi Vishwanath, Varanasi - Ghumakkar - Inspiring travel experiences. We boarded the train “12325 KOAA NLDM EXP” from Jasidih railway station to Varanasi station which started at 12:09 PM and schedule to reach at Varanasi around 08:30 PM same day. It was late by 1 hour so we reached there at around 09:30 PM. 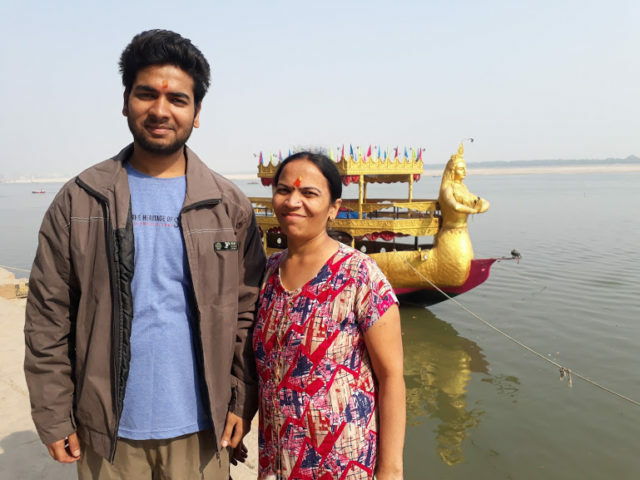 From there we took an auto which took us to our pre-booked hotel “Ganges Grand” on Godowlia crossing near church and just .5 KM from Kashi Vishwanath temple. It is highly recommended that you book your hotel near church or Godowlia chowk. Other places which are said to be very near to temple are actually situated in the narrow mazes and auto-rickshaw or cycle rickshaw are not allowed beyond Godowlia chowk. It will create a lot of problems if you are carrying luggage with you and hotel you booked situated in the mazes. Kashi Vishwanath Temple is one of the most famous Hindu temples dedicated to Lord Shiva. It is located in Varanasi, Uttar Pradesh, India. The temple stands on the western bank of the holy river Ganga, and is one of the twelve Jyotirlingas, the holiest of Shiva temples. The main deity is known by the name Vishwanatha or Vishveshvara meaning Ruler of the Universe. Varanasi city is also called Kashi, and hence the temple is popularly called Kashi Vishwanath Temple. Its name originally was Visheshwar (broken down Vishwa:Universe & Ishwar:Lord) or Lord of the Universe. Vishwanath was the name of the priest who jumped into Gyanvapi well with the Shivling when it was invaded by conquerors. As per internet research, it was revealed that this temple is always overcrowded and heavily miss-managed, but our visit turned it off and we had very peaceful darshan. Sugam Darshan tickets can be booked online at least two days in advance which cost 300/- Rs per head. The same can also be booked from counter by going physically which is available on gate no. 4. As per our experience, Sugam tickets are only required if you are visiting on Monday, Shivratri, Shravan maas or during special festival occastion only when a heavy rush can be observed there. Not heavy rush was there and hardly 50 persons inside the temple. Mostly of these people were local who come on daily basis and have obtained the pass from authories. It took us merely 5-10 minutes to enter the main temple and do our offering to Vishwanath lingam. We offered jal and our prayers and touched the shiv lingam for more than 20 seconds. It was awesome feeling. We again stood in queue to have darshan again. We did this 5 times. It’s only allowed from 04:00 AM to 04:30 AM so that you can touch shiv lingam after this a barricade is put around shiv lingam after which you can only do jalabhishek but cannot touch the shiv lingam. In our 5 turns, we were able to touch the shiv lingam 4 times. In our 5thturn, barricade was put around so we could only have offered jal to shiv lingam. Temple complex was very neat and clean. Awesome complex has small temples of KaalBhairav, Vishnu, Gauri and other Gods and Goddesses. Three domes of temples are made of pure gold. While coming out of Gate No. 1, you can notice that there is a Prasad counter which is setup by temple authorities (so no negotiation). Here packed Peda Prasad and packed dry fruits laddoo Prasad is available. The same type of Prasad counter is available on all four gate exit. But Peda Prasad was available only on Gate No 1 exit. Peda Prasad can be bought @400 Rs/Kg with packing of 100g, 200g and 500g. Dry fruit Laddoo Prasad was available @500 Rs/kg with 2 sizes. It was awesome experience and our soul was totally gratified. We also had darshan of Annapurna Mata temple and Vishalakshi Mata temple which are near by. We were back to our hotel by 05:30 AM. We again slept and had better sleep this time. Woke up again at 09:00 AM and explored the Varanasi market and went to “Baba Panarubir poori subzi shop” on Luxa road, a very famous shop for having Poori sabzi and jalebi in morning breakfast. It was heavily rushed but staff was entertaining everybody very well. 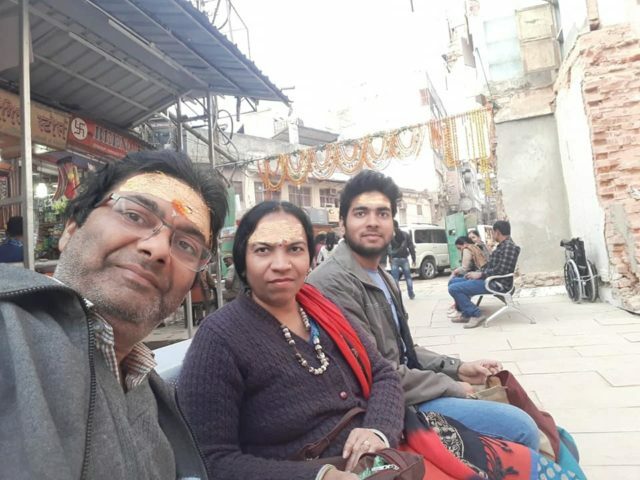 After having breakfast, we felt quite energetic and wished to visit local temples around Varanasi like Durga Temple, Sankat Mochan hanuman temple, Bharat Mata temple, Tulsi manas temple etc. All the temples are very nice. Many autos are available from Godowlia chowk which will take drop you to Durga mata temple. All other temples can be covered on foot as they are with-in half kilometers. Then we headed to Ganga ghat. Assi ghat is very famous and clean ghat. We reached there and took our bath. Ganga was very clean and government effort for “Clean Ganga Mission” was clearly visible. It was not very cold at that time but ganga water was very cold. 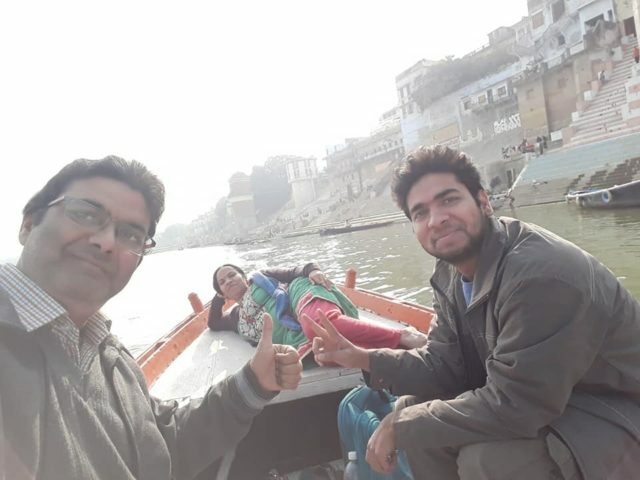 We enjoyed the ganga water a lot and remain there for around 2-3 hours. So by now we have enjoyed 2 attractions out of main 3 attractions of Varanasi. 1stattraction is “Kashi Vishwanath Mandir”, 2ndattraction is Ganga bath and 3rdattraction is “Ganga Aarti”. By that time ganga aarti preparations started. It involved a huge man power and a lot of other items which are used in ganga aarti. Main ganga aarti is performed at “Dashashwamedh Ghat”. Dashashwamedh Ghat is the main ghat in Varanasi on the Ganga River. It is located close to Vishwanath Temple and is probably the most spectacular ghat. Two Hindu legends are associated with it: According to one, Lord Brahma created it to welcome Lord Shiva. According to another legend, Lord Brahma sacrificed ten horses during Dasa-Ashwamedha yajna performed here. 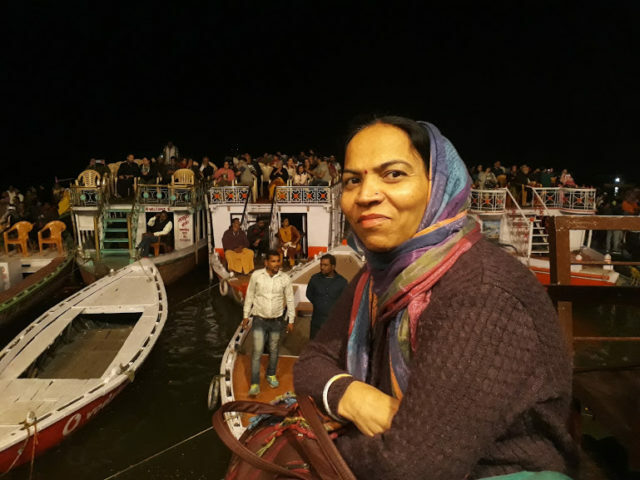 We hired a boat which took us from Assi ghat to Dashashwamedh Ghat. It took 30 minutes and is recommended not to miss it. It charged 250 Rs. Boatman explained about all the ghats on the way. We sang songs and shoot a video and enjoy thoroughly our boat ride. Dashashwamedh ghat was very beautiful and you also have the options for eatables etc. We bought cold drinks, milk bottles etc and satisfied our taste buds. Ganga Aarti preparation were in full swing. Free seats (like Plastic garden chairs) are arranged by the authorities so that people can sit and enjoy the aarti. There are some other options provided by private players. One option is that they put plastic chairs on big boat which remains static. They charge 250/- per head per chair. You can just sit on those chair and enjoy aarti. The 2ndoption is plastic chairs are put on small boat which charges 70/- per head. As per my observation, it does not matter from where you are seeing the aarti. The Aarti performers do the same steps in all four directions so everybody can enjoy the same view irrespective of direction he/she is sitting. We left the place 5 minutes earlier before completing the aarti to avoid the heavy rush which can be observed once the aarti is completed. Next we went to Dashashwamedh market. It was a big market and you have many options for shopping and eating joints. We did a lot of shopping. So by now we have completed our 3 main attractions of Varanasi. Next come in the queue is eating Banarasi Paan and Banarasi Chaat for which Varanasi is quite famous. 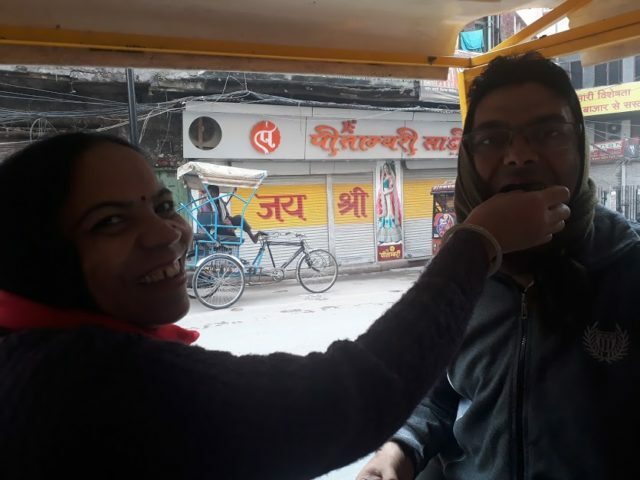 We headed towards a very famous outlet “K R B AC Restaurant” of Varanasi for Chaat. It was quite amazing experience and we enjoyed a lot of chaat over there. Now we again headed towards temple to have darshan again. You can keep all your belongings and forbidden items like shopping bags, footwear, mobile, purse etc with local shopkeepers from which you will buy flowers, water or milk. Some of them have lockers as well which are free of cost. This time also not much rush was there. We had very peaceful Shringaar Darshan over there and returned to our hotel and enjoyed sound sleep. Next day in morning we enjoyed Dosa, Idli in breakfast, the price was again reasonable and quality was awesome. 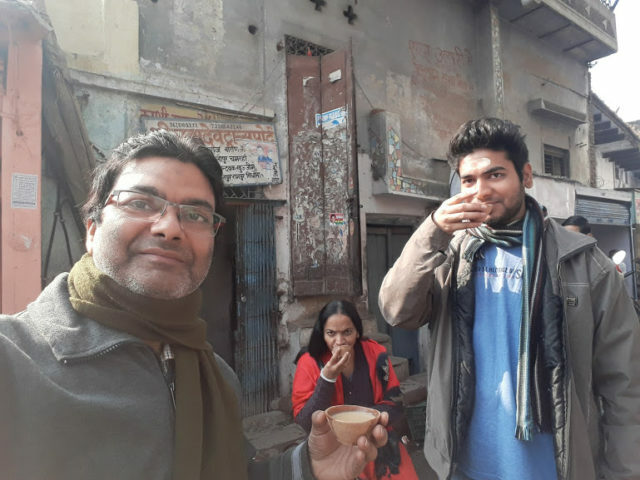 After breakfast, we enjoyed another attraction of Varanasi “Banarasi Paan”. We planned to visit Sarnath, Kaal Bhairav temple and Mrityunjai Mahadev temple. It took around 5 hours to visit Sarnath and come back. Sarnath is a place located 12 kilometres north-east of Varanasi near the confluence of the Ganges and the Varuna rivers in Uttar Pradesh, India. The deer park in Sarnath is where Gautama Buddha first taught the Dharma, and where the Buddhist Sangha came into existence through the enlightenment of Kondanna. Singhpur, a village approximately one kilometre away from the site, was the birthplace of Shreyansanath, the Eleventh Tirthankara of Jainism. A temple dedicated to him, is an important pilgrimage site. 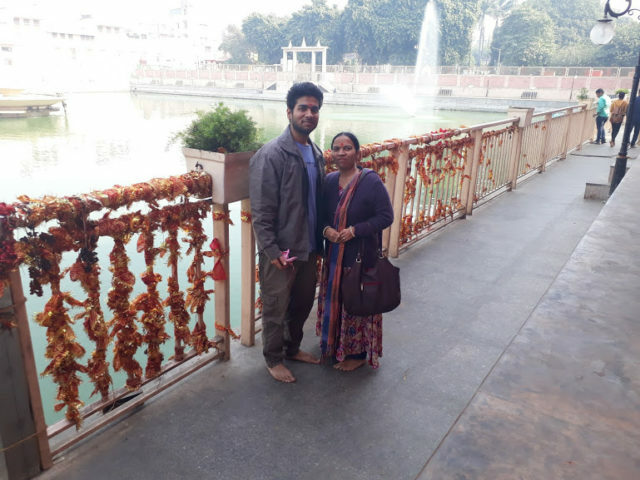 We hired a guide in Sarnath who helped us to understand the history of every place over there due to which we enjoyed it thoroughly. We were back to Varanasi around 2 PM. Our driver dropped us near Thatheri Bazar as we wanted to explore the area on foot ourselves. Bronze and brass products especially ornaments are sold here. Another purpose for coming to this market to enjoy the “Ram Bhandar” which is quite famous for amazing Poori, Sabzi and kachori. We tracked it on google map and had the yummiest kachori so far. Then we tasted “Malaiyo” another specialty of Varanasi inside the narrow lane in Thatheri bazar. It was 100 years old shop managed by Bhaiya Lall ji. After having complete Pate Pooja, we thought to visit main temple again. Local guided us and we were able to come out of maze of Thatheri bazar’s streets. 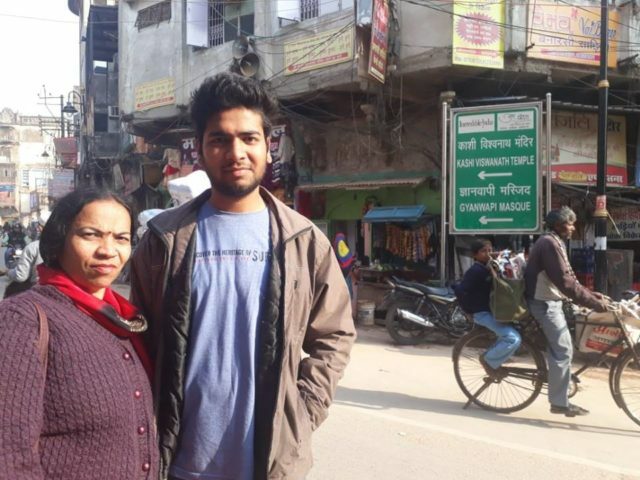 Our decision to not go to BHU and rather exploring Varanasi local on foot gave us immense pleasure. Varanasi is a city of temples. We also had darshan of a really beautiful temple which was there on the way. This time we went to Gate No. 4 of main temple. Vishwanath corridor work is going on in full swing, got the opportunity to see Gyanvyapi mosque and kashi vishwanath temple side by side. Facilities provided were superb at gate no 4.I think the area will be unrecognizable in a few years. Hope the spirit of kashi remains as it is forever. We again thought to have darshan this time and again stood in queue to have darshan. This time we put all our forbidden items into lockers available at “Kashi Vishwanath Temple trust help center” which is neat to Gate No. 4 @10 Rs/Hours per Locker. Many other facilities are also there in this help center like Souvenir shop, Sugam Darshan booking, Sitting lounge and toilets etc. While entering into temple, you are frisked many time at multiple places by security personals due to security reasons. This time rush (but cannot say heavy rush) was there and it took us around 1 hours to come out after darshan. 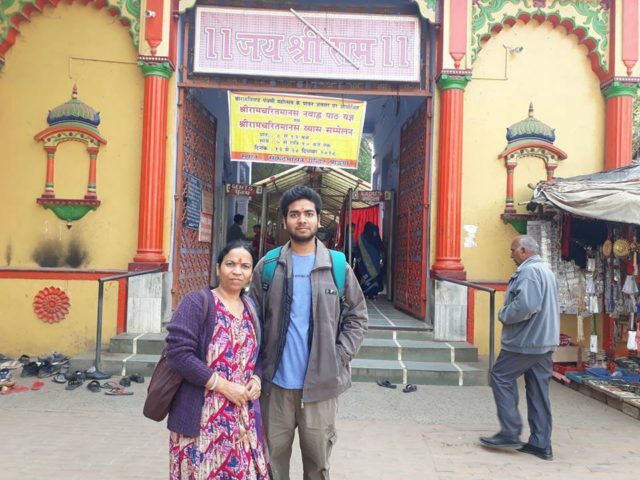 After having darshan, we headed towards Meer ghat which is also a very famous ghat. 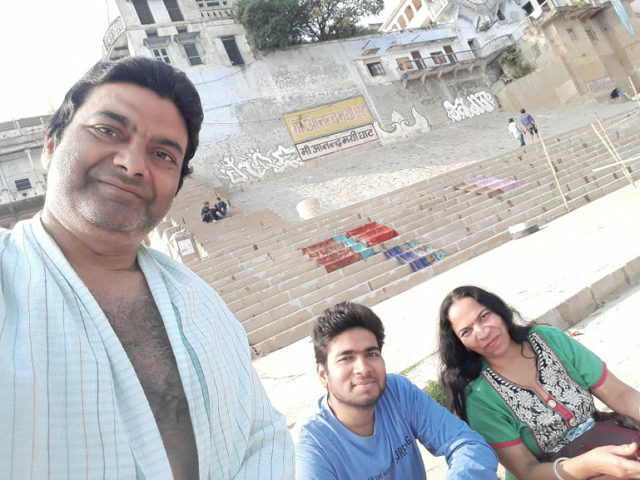 We took our bath in ganga at Meer ghat and enjoyed a lot and spent good time over there. After having darshan we went to market and do some more shopping there. After this we visited the very famous Chaat outlet “Dina Chaat Bhandar”. We enjoyed a lot of varieties over there like Tikki cholay, Samaso cholay, Gulab jamun, Tomato chaat etc, every dish was unique in its own and was quite satisfying. We boarded the train in the evening and reached our home safely and timely. 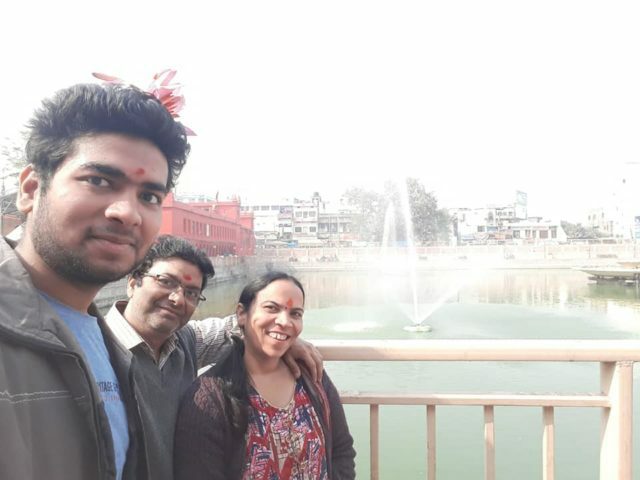 I had visited Kashi long time a go with my parents when I was too young. Still few memories I had about Baba Vishwanath Temple.